All trail building mornings follow this pattern: Please meet at the Forest Service Ranger Station in Hathaway Pines at 8:30 am. After a brief safety orientation by Jeffery Hilson, our Stanislaus Forest Service Trail Manager, we will carpool to the section of trail we will work that day. Since it often gets warm as the morning progresses, please bring layers, gloves, hat, sunscreen, bug repellant, and water. Long pants are suggested as we encounter poison oak occasionally. If you have a favorite garden tool like loppers, bring those, but we will have tools for everyone. Folks from eight to eighty-eight are invited; children should have adult supervision. We wrap up by 11:30 am, sometimes a little earlier. If you have another obligation that day, feel free to depart sooner as needed. 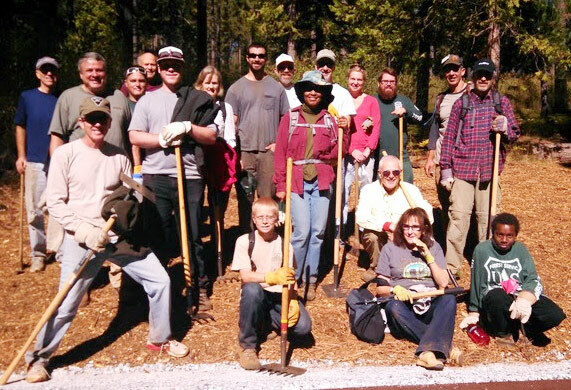 Volunteer Trail Building Mornings happen the third Saturday of each month from May through October: May 18, June 15, July 20, Aug 17, Sept 21, and Oct 19.